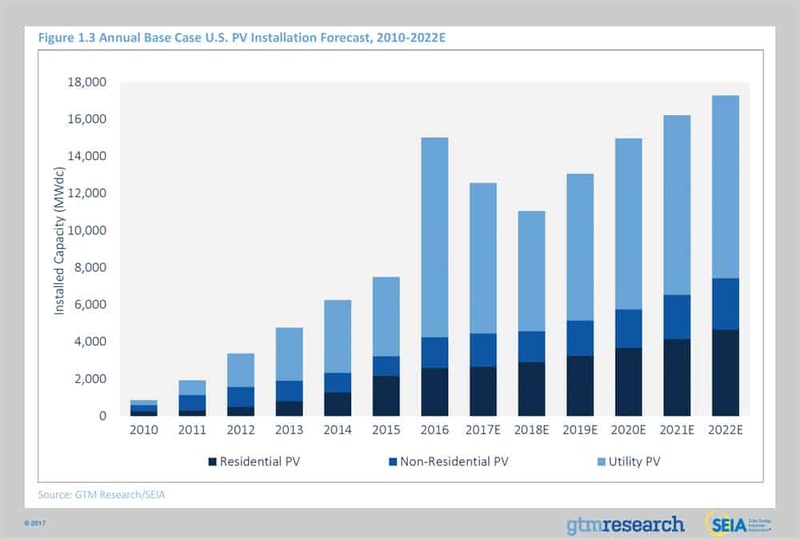 The commercial and industrial (C&I) solar markets have been a relative challenge for solar developers to exploit. The C&I market tends to fall between the stools of residential and utility-scale sectors. The 2016 numbers by the GTM Research and Solar Energy Industries Association (SEIA) has the utility sector with the lion’s share of installations, about 75% of the over 14,000 MW U.S. market installed capacity, with the over 2,000 MW residential sector edging out the C&I (described by SEIA and GTM as “non-residential”), for the remainder. The C&I sector has trouble competing against an average 15% or more lower price per kilowatt-hour rate than residential electricity prices, according to the U.S. Energy Information Agency. There is less of a discount in installed costs between the residential average of $2.80 per watt-DC versus “non-residential” of $1.85/watt, or the much lower less than $1.03-1.11/watt for utility scale in the first half of 2017, according to the latest figures from National Renewable Energy Laboratory. Further aggravating a potential solar commercial market is the split incentive between tenants and owners for much of occupied property, and a greater difficulty to reduce soft costs due to the inability to standardize products. These conditions make effective financing for C&I solar a considerable challenge. One way to begin cracking this market is a paper by the SEIA C&I Working Group. The paper, titled “ Opening C&I Solar Markets with C-PACE” is authored by Kacie Peters of Alta Energy and Mike Mendelssohn of SEIA. The report starts off with the predominance of the markets in the coastal states and Texas, and looks at the restrictions, both legal and practical, or effective power purchase agreements (PPA) in the commercial sector. The proposal of C-PACE, or Commercial Property Assessed Clean Energy, would enable financing based on the property tax assessment and would not be considered third party financing. This financing can be structured over a term necessary for a cost effective installation. The report notes that C-PACE is not a panacea because not all states have such programs. So far, 34 states have enacted state legislation and 21 have enabled local programs to operate. Seven states were identified as having effective PACE programs and constrained PPA markets. They are Arkansas, Florida, Kentucky, Minnesota, Missouri, Nebraska and Wisconsin, which helps to fill the some of the relative holes in the central U.S. C&I market.